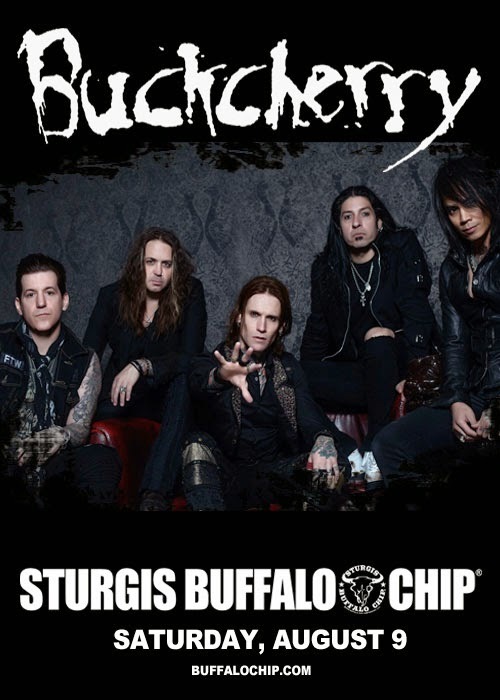 Sturgis, SD - Motorsports Music and Motorcycle Festival guests can grab one final fistful of Rally-style rock ‘n’ roll on the last Saturday of the Sturgis Buffalo Chip’s 2014 Festival with performances from Buckcherry, Sevendust and A Course of Action. A Course of Action will drive the beat in the right direction and get the party started at 7 p.m. Then as things get hot and sweaty, Sevendust will ratchet up the action with new hits and old favorites at 8:30 p.m. Sevendust will shred tunes such as “Enemy” and “Black” with its trademark alternative metal styling, driving the audience to its feet before Buckcherry takes over at 10:30 p.m.
More than forty bands will be performing this year on the seven Buffalo Chip stages scattered throughout the campground. Passes for the Largest Music Festival in Motorcycling™ may be reserved online at www.BuffaloChip.com or by calling 605-347-9000.